Today’s modern society places a major emphasis on the versatility and value of speaking two or more languages. Being bilingual has proven benefits when it comes to listening, communicating, learning, and more. A majority of adults today who cannot speak another language express a strong desire to do so, in order to open new doors for the future. While adults can definitely learn a new language, research has shown that the mind of a child has more fluidity and can more easily incorporate new linguistics into their vernacular. Your toddler can benefit from starting on the right foot, which is why our bilingual preschool is here to help! Crossing Borders Preschool is proud to provide language immersion programs in Houston, utilizing a proven curriculum taught by native speakers from many parts of the world. Whether you and your child is interested in Spanish, Mandarin, or French, our child development center is here and ready to teach! Our passion for language is constant, but our immersion preschool is only available for so many hours. Today, we’ll discuss a few tips that can help parents promote bilingual learning for their little star outside of our school, as well as the value that our immersion program provides for young students. When done, be sure to contact our childcare experts to enroll your little star! Our country’s passion for television and movies creates the perfect chance for you to begin saturating your child’s vocabulary with bilingual words and phrases. Many television networks today feature a nice selection of bilingual shows that are both educational and effective at helping young learners immerse themselves in a second language. If your choices are limited, you can go online to find a wealth of materials to choose from. From learning modules to your child’s favorite show dubbed in Spanish, nearly any form of bilingual media can be found online if you invest enough effort. Shows and movies are a great way to introduce your little one to a new language because they take the form of speech that flows better and sounds more genuine. Textbooks are great for learning a new word, but this learning environment does not include the human element. Young children tend to absorb more information from sources that they like, as these exciting entertainment sources tend to receive more consistent attention and engagement. Learning a language as it is spoken will certainly help your young student on their road to bilingual success. Building on the shorter attention span of young children, you both can benefit from downloading an interactive app that expands the mind through thinking exercises and conceptualizations ofe more complex ideas. Children love to master electronics such as tablets, phones, and more. Instead of handing your child a simple game that simply passes the time, try installing helpful apps such as Mind Snacks, Dic-Dic, and other fun choices. These interactive programs offer a variety of languages, from Arabic to Portuguese. Many apps feature intuitive controls to give you as the parent the maximum amount of control over how the learning is presented and the starting difficulty level. One useful way to promote language learning for your little one is to conscript help from a bilingual acquaintance. Whether you have a brother that studied in France or a neighbor who excels in Spanish, constructing small learning sessions can provide major benefits for learning. While apps and shows are helpful for bilingual learning, it is hard to beat talking with a native speaker who can provide personalized instruction. This approach may prove very beneficial when you consider that it will be an affordable option that provides valuable insight into the culture and emotion of a different location. Your child will develop a knowledge of the language and also the humans who have developed and communicated with this language. Creating a plan that actively engages your child’s mind is helpful for creating long-term gains in language comprehension. 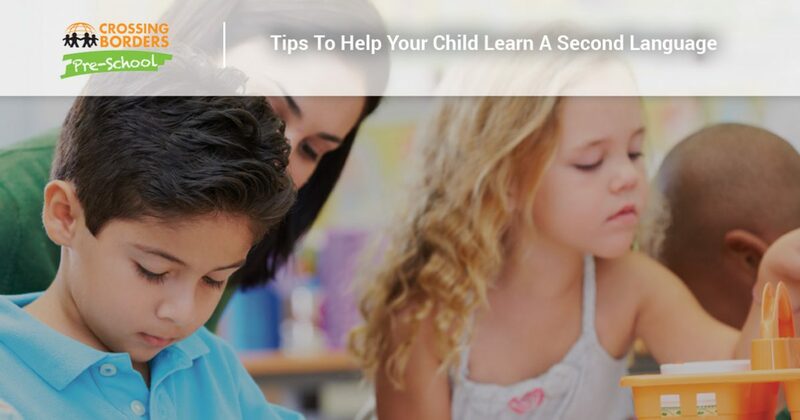 Repetition and written instruction is helpful, but the cognitive benefits of making an exciting activity can prove to help your child learn a new language while they have fun. Incorporating engaging tasks into your learning plan can be easy, as the options of fun child activities are nearly numberless. Nearly any project that you can find online can include language learning to create an exciting, efficient learning experience. When they’re young, your little learner looks to you for guidance in all of life’s endeavors. Parents are the source of guidance, protection, and everything else that a child needs, making you the leader of your kid’s education. Now might be the perfect time to enrich both of your lives, with you learning the same language at the same time. Through adaptive adult learning apps and instructional resources, you can master a whole new way of communicating with your child. The advantages here are many, as the two of you can work together to become more comfortable with the new language. One of the best ways to encourage language learning is to take your child to a daycare center that holds a sterling record of helping young minds to master new linguistics. By focusing on language immersion, your child can quickly develop the ability to comprehend and speak a new language! Crossing Borders Preschool is proud to be your go-to source in Texas for this endeavor, providing a full curriculum of learning activities in addition to our language development. If you are looking for a fun, effective language immersion program in Houston for your little one, be sure to contact us today to find out more!